Got leftover pork? Shred it up and serve with creamy mashed avocados in these quick and easy burritos. Deliciousness for six—in just 20 minutes. Mash avocados with next 4 ingredients in medium bowl. Stir in cilantro. Spread 2 Tbsp. avocado mixture onto each tortilla; top with 1/3 cup meat and 1 Tbsp. cheese. 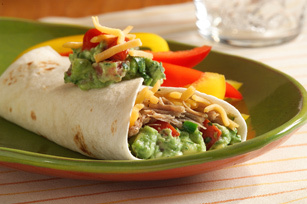 Roll up, tucking in both sides of each tortilla as you roll it up. Top with any remaining avocado mixture and cheese. Serve with salsa. Balance this main dish with a smart side dish, such as a mixed green salad or hot cooked vegetable. Cut avocado in half from top to bottom using a chef's knife, carefully going around the pit in center. Place the half with the pit, face up, on a cutting board; hit it sharply in the middle with the knife blade. Twist the knife and lift out the pit. Hit the knife on the cutting board. This will cut the pit in half, releasing the pit.